Amin Hotel i Kairo, Egypten : Boka nu! 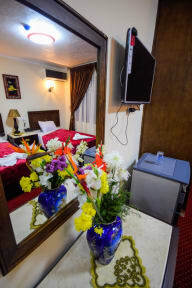 Each room is equipped with a flat-screen TV, 24/7 hot water, Air conditioner, Telephone, Mini Bar, Hair dryer.Some rooms feature a seating area for your convenience. All rooms have a private bathroom for your comfort, you will find slippers and free toiletries and free access WiFi . The Nile River or visit the Egyptian Museum, all within 15 minutes’ walking distance. The hotel is within 30 minutes’ drive to Pyramids of Giza. 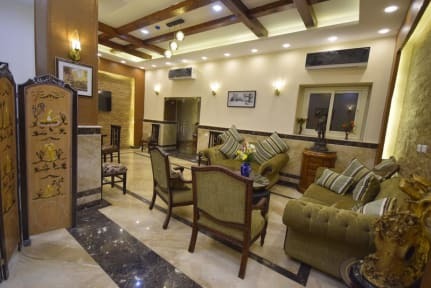 Cairo International Airport is 17 km from the property. -Free pick up from the airport when you booking for 3 nights. -Cancellation policy: 24h before arrival. -Payment upon arrival by credit cards, debit cards.